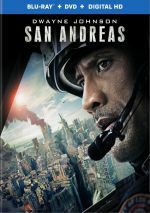 An echo of the epic disaster flicks from the 1970s, 2015’s San Andreas introduces us to Ray Gaines (Dwayne Johnson), a pilot who flies rescue helicopters for the Los Angeles Fire Department. Left to regroup after his wife Emma (Carla Gugino) separated from him, he plans to drive his daughter Blake (Alexandra Daddario) back to college in San Francisco. Unfortunately, an earthquake strikes Nevada and forces Ray to head there for rescue work. This means Alex heads to San Francisco with her mom’s new boyfriend, super-wealthy Daniel Riddick (Ioan Gruffudd). Matters intensify in Northern California. While Blake hangs out at Daniel’s office, another earthquake strikes and creates disaster in the Bay Area. This gives Ray a new mission: to find and save his daughter. San Andreas offers a tale of two movies. When it focuses on characters and personal drama, it sags. Burdened with woefully trite dialogue and cardboard cutout personalities, these moments consistently falter. We care about those involved in a superficial “because we’re supposed to” manner and that’s about it. None of the actors manage to overcome these script issues. I like Johnson in comedic roles, but he seems less interesting when he takes on parts like Ray. That’s counterintuitive, as Johnson’s physique makes him appear to be an ideal movie hero – and he does manage to pull off the action bits well enough. Johnson just comes across as less convincing when required to execute dramatic sequences, and the film’s completely unironic tone doesn’t help. Again, Johnson works best when he gets to indulge his comedic side, so the movie’s self-serious tone doesn’t suit him. I don’t fault Johnson for this deficit, though, as the film’s overly dramatic feel hurts the other actors as well – especially Paul Giamatti. He plays a scientist who finds a way to predict earthquakes, and he ends up stuck with the tale’s most ponderous dialogue. It’s not a good fit for a talented actor. So when San Andreas delivers character moments, it sags, but when it gets into the action and disaster side of things, it excels. The film literally forces our heroes to deal with danger found on land, at sea and in the air, so it comes up with a slew of threats to throw at them. Do these sequences become over the top and unbelievable? Of course, but that’s why we watch movies like San Andreas. If told realistically, everyone would be dead or maimed within 10 minutes – what’s the fun in that? So I’m on board with the movie’s crazed sense of mayhem. It boasts strong production values, so it pulls off all the destruction and damage well. A good mix of practical and computer effects, the film places us in a world convincing enough to create a believable environment. Due to those cardboard characters, San Andreas doesn’t become a great action film, but it still entertains. With tons of disaster goodness on display, it turns into a solid genre effort. 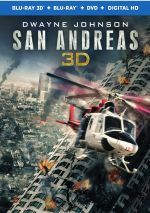 San Andreas appears in an aspect ratio of approximately 2.40:1 on this Blu-ray Disc. The film offered a good but unexceptional transfer. Minor issues affected sharpness. While most of the movie presented nice clarity, some wider shots looked a bit tentative, and I saw a smidgen of shimmering at times. Still, the majority of the flick appeared solid, and no signs of jaggies or edge haloes occurred. The movie also lacked print flaws. In terms of palette, San Andreas favored a combination of teal and amber. These remained fairly restrained and appeared well-developed enough. Blacks showed reasonable depth, and shadows were good, though a few shots looked a bit murky. All of this was enough for a “B”. I felt more consistently pleased with the excellent Dolby Atmos soundtrack of San Andreas. Because I don’t have an Atmos-equipped system, this played back as a Dolby TrueHD 7.1 mix, and it impressed. With tons of destruction and mayhem on display, the soundscape offered nearly constant room for information to emanate from the various speakers, and it used those chances well. The mix delivered wall-to-wall auditory material that spread out across the speakers in a satisfying manner and that blended together nicely. This meant a tremendously active track. The surrounds worked as nearly equal partners and kept the mix humming. 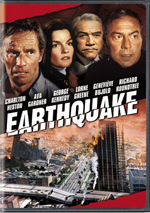 The earthquake scenes fared best, but plenty of other action/disaster moments made this a consistently amazing soundfield. Audio quality also satisfied. Speech was natural and concise, while music sounded peppy and full. Effects turned into the primary factor, and those elements appeared accurate and vivid. Bass response added real depth and rocked my subwoofer. If you own a fancy-pants home theater, you spent that money for soundtracks like this - San Andreas offered one of the best multi-channel mixes I’ve heard. The package includes an audio commentary from director Brad Peyton. In this running, screen-specific chat, he discusses story/character domains, sets and locations, action and stunts, music, editing, cast and performances, various effects and connected topics. At the start, Peyton notes that this is his first commentary, and he does well as a rookie. Inevitably, technical subjects dominate, but Peyton spreads the wealth and ensures he covers a good variety of issues. While not the most fascinating track, Peyton gives us a solid look at the film. Three featurettes follow. 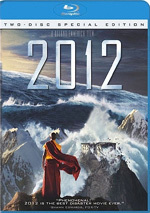 The Real Fault Line lasts six minutes, 23 seconds and comes with notes from Peyton, producer Beau Flynn, visual effects producer Randall Starr, executive producer Rob Cowan, special effects foreman Jim Leng, stunt coordinator Allen Poppleton, co-producer Hiram Garcia, and actors Dwayne Johnson, Carla Gugino, and Ioan Gruffudd. “Line” tells us how the filmmakers created the massive earthquake scenes. This tends toward a puffy feel, but we still get some decent notes. Dwayne Johnson to the Rescue goes for nine minutes, 24 seconds and features Peyton, Johnson, Flynn, Garcia, Poppleton, Gugino, Cowan, Leng, writer Carey Hayes, and actors Matt Gerald, Alexandra Daddario, Paul Giamatti and Kylie Minogue. A few behind the scenes shots entertain, but this mostly acts as an ode to the greatness of Johnson. During the six-minute, 13-second Scoring the Quake, we hear from Peyton, Flynn 2and composer Andrew Lockington. As expected, “Quake” looks at the movie’s music. This becomes a brief but satisfactory overview. Eight Deleted Scenes fill a total of four minutes, 40 seconds. That’s an average of 35 seconds per sequence, so viewers shouldn’t expect much from the cut footage. They offer a few minor character moments and some additional exposition but nothing memorable. We can watch the scenes with or without commentary from Peyton. He tells us about the sequences as well as why he cut them. Even without much room to chat, he delivers nice insights. Finally, we get a Gag Reel (1:22) and a Stunt Reel (2:56). The former shows goofs and giggles, while the latter depicts something similar with an orientation toward the stunt performers. Neither seems especially interesting, though at least the gag reel offers a few shots of Daddario in a bikini. A second disc offers a DVD copy of San Andreas. It includes the commentary but lacks the other extras. No one will mistake San Andreas for a great film, as it lacks substance and delivers painfully cheesy moments at times. Still, it packs a lot of action and excitement into its 114 minutes, so it gives us a fun, brainless disaster-based thrill ride. The Blu-ray offers mostly good picture, exceptional audio and a decent set of bonus features. San Andreas becomes a largely exciting action flick.